NO ALCOHOL AT PUBLIC PARKSWe know kickball and adult beverages go together; however, alcoholic beverages are illegal at public parks. Please don't bring it to the field; Not only do you risk getting cited by the police, we risk losing access to fields. Please help us protect kickball, and wait until you get to the bar. Team rosters shall include a minimum of 15 players, including at least 5 of each gender. The maximum number of players on the field is 10, with at least 4 of each gender. The minimum number of players on the field is 7, with no gender minimum. All players who are fielding or plan to field must be placed in the kicking order. When a team has fewer than the required number of players of a specified gender available, players of one gender may not be substituted for members of another gender. For example, if a team has 10 total players available at game time, but only 3 are female, the team must either play short with 9 players or borrow a player from another team that is not their opponent per Rule Team 7. If the team has fewer than 10 players overall available, or has fewer than 4 of each gender available, that team may invite a registered player from another team other than their opponent as a substitute. Gender substitute rules still apply. This is permitted only during regular season games, and only if the team is short. A substitute from another team may only be used in the event of absence, not for the purpose of allowing rests or breaks for individual players. Fielding teams are required to play catcher and pitcher. No substitutes for the catcher are permitted during the inning; catchers may only be changed between innings. Late Registration: a team may add players to the roster through the 4th scheduled match provided the team captain approves. The league fee shall be pro-rated for the remainder of the season. All players must be formally registered with the League and paid in full prior to playing. Any team that has players not wearing their league-provided shirt can be called for a roster check at any time by the ref, field manager, or the opposing team. If players are found to not be on the roster that are playing it will result in an automatic forfeit. Each game shall be officiated by a League-assigned referee. Tracking all counts and outs. The referee shall eject a player from the game if that player engages in unsportsmanlike conduct. An ejected player must leave the field and facility immediately; failure to do so may result in removal from the league. Games may be played on any flat grassy area with sufficient space for an infield and outfield. The distance between bases shall be 60 feet. First base shall include a safety base placed to the right; overruns must be made on the safety base. The back corners of the kicker's box shall be placed along the foul lines extended 10 feet from the home plate. The triangular areas between the top edge of the kicker's box and the foul lines between the outside edge of the kicker's box shall be considered "fair" territory for balls traveling on the ground through that area. The field shall be bounded by a sideline measuring 10 feet from the foul line. No player or spectator shall reside within the sidelines except for those actively playing, the game officials, and a 1st and 3rd base coach. The safety base is for the runner only. You must play bases inside the field of play in order to tag a runner out at the attempted/forced base. Each game shall be completed in no more than 7 innings or 60 minutes, whichever comes first. No new inning may begin after 50 minutes; any inning being played after 50 minutes shall be the last inning of the game. The clock has passed 60 minutes; the score shall revert to the score at the previous full inning, with the team leading at the end of the previous full inning declared the winner. In the event of a tied score after the final inning, the game shall be recorded as a tie. A coin toss, rock-paper-scissors or other mutually agreed upon binary game of chance shall determine the home team, who shall have a choice to either kick first or field first. The pitcher shall roll the ball, keeping at least one foot on or behind the pitcher's plate until the ball is kicked. No defensive player may cross the invisible line between 1st and 3rd base prior to the ball being kicked. The first violation of encroachment of the invisible line will result in the team being warned. The second violation, and thereafter, will result in the kicker choosing the option of re-kicking or being awarded first base. Pitcher shall roll the ball, keeping at least one foot on or behind the pitcher's plate until the ball is kicked. The pitch must pass within the 1-foot strike zone around and above the home plate. The pitch must have bounced twice or be rolling on the ground when crossing the plate. Overhanded pitching is not permitted: Pitcher must release the ball from below the waist. The catcher must remain behind the kicker and directly in or behind the kicking box until the kicker makes contact with the ball. The catcher may NOT stand in front of the kicker or to the side of the kicking box or so closely to the kicker as to interfere with his or her ability to kick, until contact is made with the ball. Each team must exchange kicking orders prior to the start of the game. There must be at least 4 players of each gender in the kicking order. If there are fewer than the required number of players of a particular gender, that point in the lineup shall be counted as an out. There is no alternating gender requirement in the kicking order. 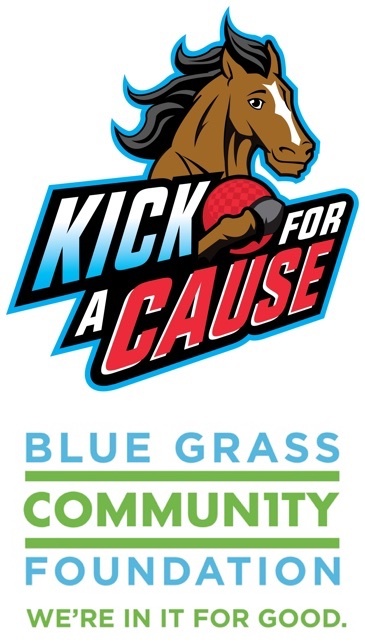 All players who have fielded or will field must be included in the kicking lineup, except for injured players who have been withdrawn from the game. 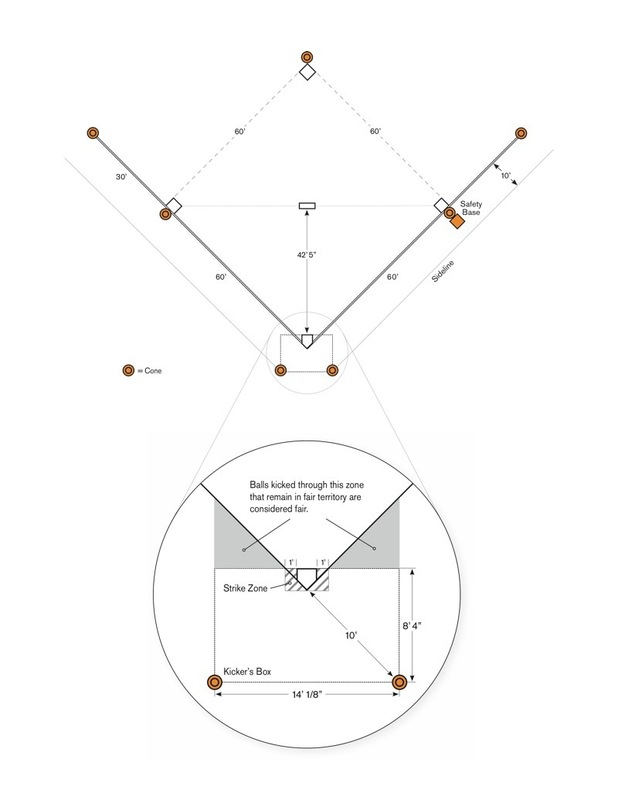 When bunting is allowed: If the kicked ball comes to rest in the area between home plate and the 1st base-3rd-base line, inside the foul lines, it shall be considered FAIR. When bunting is NOT allowed: If the kicked ball comes to rest in the area between home plate and the 1st base-3rd-base line, inside the foul lines, it shall be considered a FOUL. The ball crosses the strike zone without being kicked. The kicker swings at but misses the ball. The ball is kicked foul. The ball lands or is touched in foul territory. The ball lands inside the foul line, but rolls outside the foul line before reaching the 1st or 3rd base lines. A ball that lands past the 1st or 3rd base lines but rolls into foul territory shall be considered fair. Contacts the ball behind home plate with any part of the body above the knee. The kicker kicks the ball with any part of the foot planted outside the kicking box, including in front of home plate. The kicker makes a "double-kick", i.e. kicks or contacts the ball after the initial kick while still behind home plate. Ball fails to pass through the 1-foot strike zone around home plate. Ball bounces more than 1-foot above strike zone. Ball bounces fewer than twice prior to crossing the strike zone. At Kirklevington Park home runs are allowed. Only 2 home runs are allowed per game. Any subsequent home run will be a ground rule double. Head-first sliding will result in an out. Stealing bases and leading off bases is illegal. A player who was leading the base prior to the hit shall be called out. Sliding at first base is illegal. A player who slides at first base shall be called out. Runners must use the safety base. There is no infield fly rule; the runner may commit when the ball is touched by a fielder, regardless of whether or not it was caught. Bobbling - After a ball is kicked a runner may leave his/her occupied base, if the ball makes contact with an opposing player before touching the ground but is not directly caught, the runner may advance. If the ball is bobbled and then caught, the runner is still allowed to advance, given the runner waited until the ball was kicked to advance. Play shall end when the pitcher has control of the ball within 10 feet of the pitcher's mound. Any runners in motion at this must stop at the base they are moving toward. If it is determined by the referee that the runner has tried to advance and is not halfway to his next base, the runner must return to the base he was last on. This is considered stealing. Fielder catches a fly ball. Base is tagged on a forced run. Runner is tagged by a fielder in possession of the ball. Comes in contact with the ball, except when thrown by a fielder at the head (unless sliding). Runner is off base when the ball is kicked. A runner that is tagged in the head by a ball shall be considered safe at their intended base, unless that player was sliding or intentionally placed their head in the path of the ball. In the event of an overthrow into foul territory in an attempt to make a play, the runner may advance only as far as the base they are running toward plus the next base. This is a restriction on the advance of the runner; runners are NOT automatically awarded the base. Pinch running due to injury is permitted at 1st, 2nd and 3rd base provided the pinch runner is of the same gender. The runner who was substituted for shall be removed permanently from the game. Pinch running at kick is not permitted. The inning shall advance when a team scores 7 runs in the inning. The mercy rule shall be called and the inning advanced immediately upon scoring the 7th run. The mercy rule advances the inning; it does not end the game except when team is down by more than 7 going into the 7th inning, more than 14 going into the 6th inning, or more than 21 going into the 5th inning, the game will be called. Any players who show up after the game has started shall be added to the end of the kicking order. Teams must be ready to play and meet game start requirements within 5 minutes after the posted game time. If a team is not ready to play at 5 minutes past the posted game time, it shall incur an immediate 2 run penalty, awarded to the opposing team. If a team is still not ready to play after 10 minutes, it shall incur an additional 2 run penalty. If a team is not ready to play after 15 minutes, it shall forfeit the game, with the opposing team receiving a total of 6 runs, for a final score of 6 - 0. Ties are not permitted in playoff games. If a regulation game ends in a tie, it shall be broken using the following method: each team shall choose 3 kickers, at least one of each gender. The opposing team will be in the field like a normal inning. You will receive points in overtime for each base reached. Single= 1 point, Double= 2 points, Triple= 3 points, and a Home run= 4 points. If the kicker registers a single and attempts to go for 2nd and is thrown out that kicker will register 0 points. After each batter the bases will be cleared. Who ever receives the most points in the Tie Breaker will be declared the winner.